Microsoft PowerPoint 2010 & 2013 are popular versions of MS office and they are widely used by users all over the world. These latest versions achieves great features then previous versions like MS Office 2003. Presentation documents made by MS PowerPoint 2010 and 2013 are saved in the format of PPTX (.pptx) by default. It is new file format adopted by MS Office and it combines XML (extensible markup language) and architecture and zip compression in order to decrease file size. As we all know, MS PowerPoint is one of the most useful tools to make slide files for presentation which contains texts, pictures, animations, sound and other multimedia files. It can be used to commercial conferences as well as educational courses. As the technology advances and program updated, Microsoft Office keeps updating its produces, and most users get used to the latest version and like these improvements. However, there is an unhappy truth that PPTX file may get corrupted or lost for some reason. To some extent, we should admit that all files on computer can get lost or damaged. Here sums up main reasons of PPTX files corruption and missing. Computer virus or program bug can delete or damage PowerPoint files or even all files of an entire partition. System shuts down or reboot due to system error or power outage suddenly while you are working on a PPTX file. When MS Office takes longer time to save a PPTX files which is larger than common documents, user close MS Office before it finishes saving. PPTX files gets deleted or formatted by users accidentally. It is obvious that nobody can afford such an issue of PPTX file loss, as we have spent a lot of time on them and it is hard to recreate them within short period of time. In such difficult situation, a recent backup of missing files will be life-saver. That’s why we should backup data in regular pace in case of sudden file loss. What if we do not have a valid backup, because we may not have time to get lost PPTX files backed up? Then we should consider MS file recovery software to achieve PPTX file recovery. 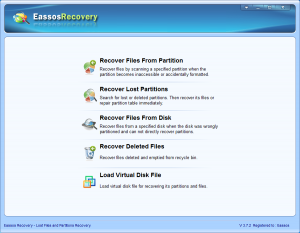 PowerPoint recovery can be fixed by Eassos Recovery. This recovery software is able to retrieve lost MS Office 2010 & 2013 files that are deleted, formatted or corrupted easily. It is the best hard drive recovery software, for it is effective and 100% safe for both professional and non-technical users. All users are allowed to test and check its performance before payment since it has a trial version. Next, let’s see the recovery steps of PPTX file recovery. Step 1: Select correct recovery mode for lost PPTX files. Step 2: Select storage devices that stored lost or corrupted PowerPoint files and click “Next”. Step 3: Preview and save recovered PowerPoint files. 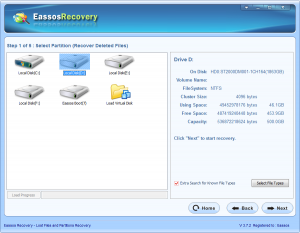 This entry was posted in Data Recovery and tagged MS file recovery software, PowerPoint recovery, PPTX file recovery by EASSOS. Bookmark the permalink.